Mirrors can also be a work of art. Not only do mirrors open up & brighten any room, they also give you an opportunity to express yourself. We frame large and small mirrors, flat & beveled mirrors, specialty glass mirrors, for living rooms, dining areas, powder rooms and offices, over sinks, dressers and lean to wall mirrors. 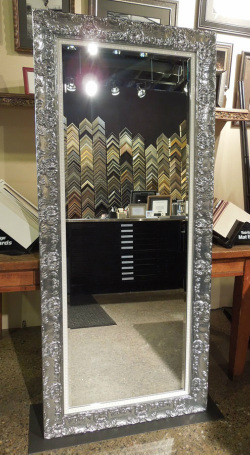 Come into one of our showrooms to see a variety of framed mirrors – or have a mirror custom made to any size and style from classic to contemporary. Measure the space the mirror will be hanging – bring the dimensions when visiting us. Signing out moulding samples to see how it will look at your home or office also available and encouraged. Our standard turn around time is 3 weeks for custom mirrors, though rush orders can be accommodated. Delivery and / or installation services available - simply let us know & we can schedule the install around your schedule. Reflect light from a window or a chandelier or other lamp to create a more open, spacious feel and lighten up darker areas of a room or hallway for better visibility. Does your room have lots of entrances? Perhaps you have a fireplace on one wall and large window on another or a seating arrangement that looks off center? A large mirror can help anchor the eye, creating a statement piece for the room and giving your space a whole new look and feel. Well-placed mirrors give the illusion of more space. Hang a mirror on the wall or place a large mirror against a wall to make a room look more spacious. Especially helpful in narrow rooms or hallways. Of all the benefits of mirrors, the practical use is one of its most important. Update the mirror in your powder room or in an entrance way to provide a beautiful setting for a quick look before leaving the house.